Experiencing the 2015 MLS Cup run for the Portland Timbers is something that I will never truly forget, mostly because it made up for several years of futility and coming achingly close yet crashing at the most inopportune moment. The experience for me following the Timbers during their various U.S. Open Cup runs has been diametrically different - I stood in the middle of section 107 dumbfounded as Hollywood United celebrated in our home park. I cursed the ground that ever brought bile green kits here, and I watched in agony pitchside in 2010 when the hated Flounders defeated us again here. This was even more despicable considering what happened in 2009 when our side gave them everything, but just couldn't figure out how to will together another goal. I've made enough trips to Starfire to curse the grounds of that very stadium, and can now utter the words Cal FC and not go into convulsions. It's the ultimate love hate relationship. I absolutely love the concept of the U.S. Open Cup, the annual tournament that crowns the best amateur or professional soccer club for that calendar year in a single elimination competition. The winner gets a berth in the CONCACAF Champions League and bragging rights as the best club for that year, but it also brings together teams that wouldn't normally play each other otherwise. I got a kick out of seeing the Kitsap Pumas, Sonoma County Sol or Wilmington Hammerheads visit Portland because it was something very different. I had resigned myself begrudgingly that the USOC draw would always eventually bring Seattle and Portland together because it often did, and the matches added so much more to this spirited rivalry. Major League Soccer has been decidedly dominant since joining the tournament in 1996, as they have won every year except for 1999, when the Rochester Raging Rhinos (complete with clip art logo) shocked the tourney by winning it all. Suffice to say, the competition has always had some dramatics to it that often are lost with the matches taking place midweek as teams are playing in their regular leagues. The USOC also has specific rules that are slightly different than league competitions - teams can only use 5 international players on their game day rosters for USOC matches - although they eliminated the bidding process for hosting matches that prohibitively favored certain franchises and went to blind draws and coin flips in 2011 to add some parity to hosting. The Timbers have put forth more emphasis on fielding stronger rosters for the competition recently, but have admittedly prioritized this behind other priorities in the season, such as league matches, in years past. In managing fitness and health, I can imagine it's difficult to throw in a competitive fixture right in between regular league matches, but in many ways, that is the beauty and the curse of the competition. In current seasons since 2015, MLS teams have been drawn into the competition in round 4 after lower division professional and high level amateur sides have played in opening qualifying rounds, and the Timbers have usually found themselves facing another MLS team. For 2018, Portland drew San Jose in their opening match, and after winning, they advanced to host the Los Angeles Galaxy. When they claimed victory, the next round produced a really odd situation for the Timbers - playing the Los Angeles Football Club on July 18. Ironically enough, the Timbers were already slated to play a league match there on July 15, and since LAFC won the draw to host, Portland would travel to California and extend their stay to cover both matches. In a weird quirk from previous years, USSF allowed league matches to count as Open Cup qualifiers or competition if the same 2 teams were playing a league match and got drawn together in one of the rounds (see the Timbers 2004 season for an example of this oddity). 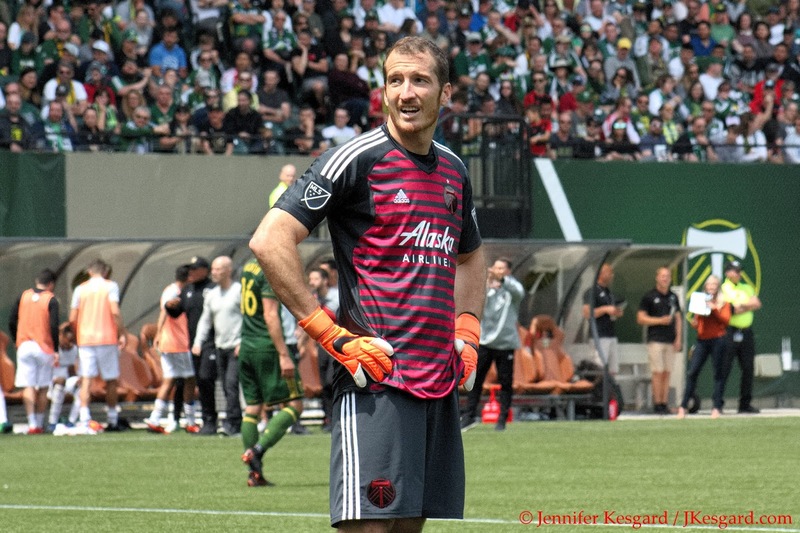 Enjoying a 12 match unbeaten streak going into the July 15 match, Portland and LAFC played to a scoreless draw as both sides played an extremely tactical affair. That's a very fancy term for putting together a conservative, defensive approach that will allow offense only if the opportunity presents itself - you might know it as "parking the bus". Many on social media referred to the match as boring, but I found the action to be very calculating and precise - the Timbers defense really worked well together to clog the lanes and frustrate the LAFC attack. When they shook loose, Jeff Attinella was able to make the play to keep the score at zero, as he's been playing some of his best soccer recently. 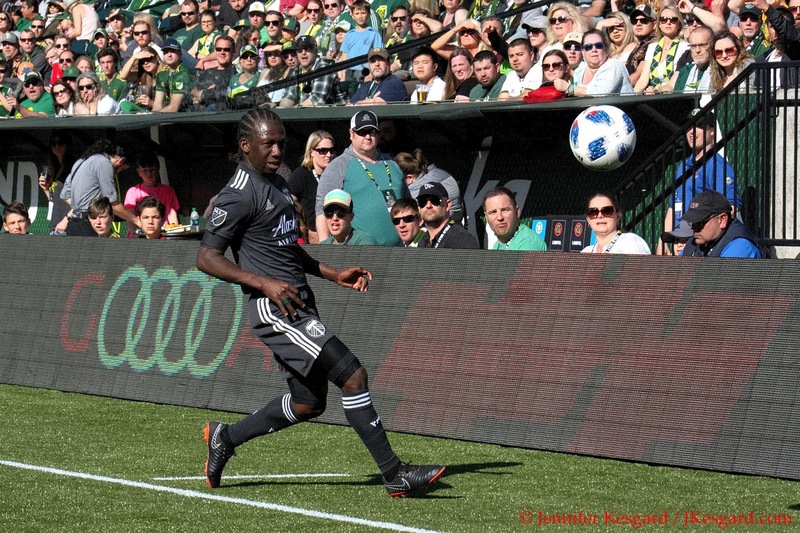 Timbers Coach Gio Savarese has been instrumental in rotating players to keep up form and fitness, but recently, it's been the spine of Attinella, Larrys Mabiala, and Diego Chara that have really held together the middle. 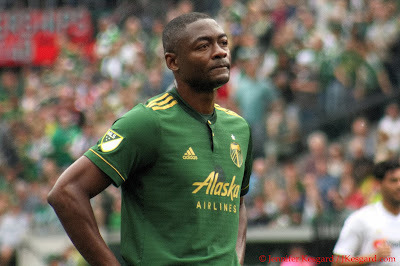 Defender Zarek Valentin has been outstanding as well, and Mabiala has been aided by Julio Cascante, Bill Tuiloma, Lawrence Olum and Liam Ridgewell, but really, the improved defense has been paramount in the Timbers' progression from average club with intriguing parts to a potential championship contender. 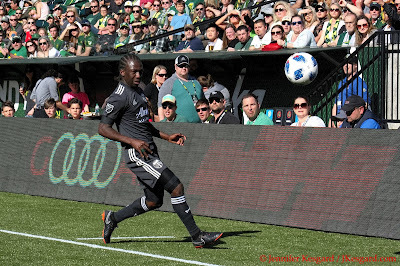 The odd back to back also gave some opportunities to scout a bit, but Portland had already seen LAFC earlier when the sides played in Portland back in May for win 5 of their streak. 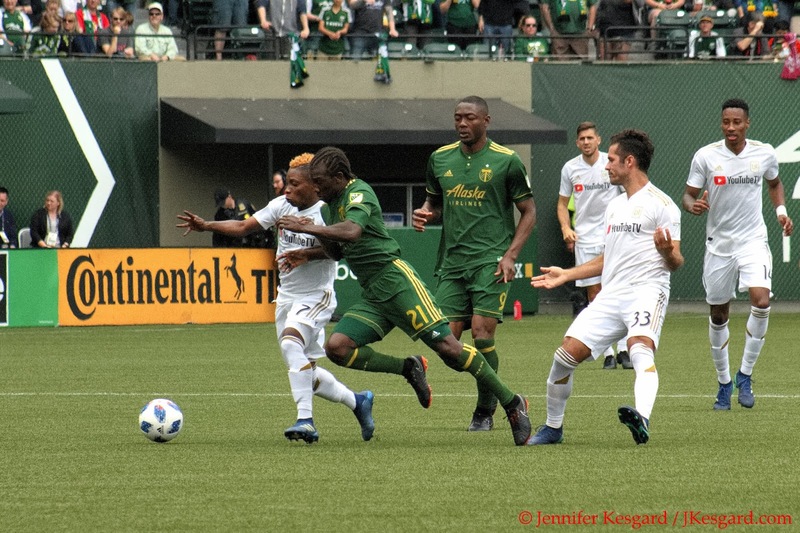 When it was said and done, the streak ended in a feisty 3 to 2 loss in which the Timbers had plenty of opportunities, but LAFC took advantage of some early mistakes then held off the late rally. 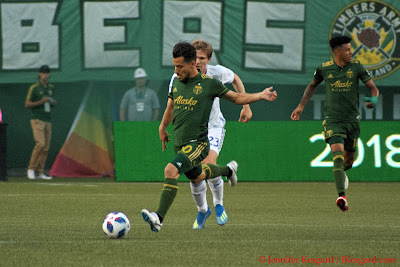 In a crazy back and forth affair, fans could pull apart many different story lines to try and dissect this loss - the playmaking of Carlos Vela, who was far more influential in this match than he was in match 1, some slow reactions by the Timbers defense, or bringing on bigger weapons too late. But talking about that would distract for the three massive story lines that emerged at the end of this match: did LAFC field an illegal lineup, and since this is up for dispute, the Timbers filed a formal protest after the match to have the situation investigated? Did a Timbers player use a slur against a member of LAFC? Is the Timbers Sunshine Flag offensive? One of these issues by themselves would be big enough to consume words and time, but the fact that all three emerged from this match sent Timbers twitter into massive overdrive. I will do my best to boil them down, but obviously spending time on the #RCTID hashtag will give any reader hours of entertainment or ample opportunity to smash your forehead into the laptop screen. Was LAFC's lineup illegal? The rule in question is from section 203 of the official U.S. Open Cup rules: A team may list up to 18 players on its game day roster. Professional teams may have no more than 5 foreign players listed. Amateur teams are not restricted as to the number of foreign players they may list. Foreign players shall be those players who are not protected individuals as defined in 8 U.S.C. § 1324b (e.g. U.S. Citizens, lawful permanent residents, asylees and refugees). MLS rules allow a VISA or green card for a player to count them as domestic against the 8 international slots (which could be more or less if the team has traded them away or acquired them), but USOC rules are clear. In this case, LAFC's starting lineup listed 7 players that are considered international: Vela (MEX) Laurent Ciman (BEL), Marco Urena (CRC), Diego Rossi (URU), Adama Diomande (NOR), Marc-Anthony Kaye (CAN) and Dejan Jakovic (CAN). While Jakovic has a green card, Kaye doesn't and as such, would technically count as international. Until the U.S Soccer Federation indicated that Kaye could count as domestic per LAFC, and their roster indicated this as such. Portland didn't appear to be aware of this, but the protest delayed the announcement of the next round fixtures for the USOC as the disciplinary committee meets on July 21 to discuss the matter. Savarese indicated in comments on July 20 that the team accepts the results of the match and has moved on, but filed the protest to ensure proper enforcement of the rules. Section 306 of the USOC rules states: A protest related to an Open Cup match must be filed in writing with the Open Cup Commissioner and delivered via hand-delivery, courier, certified mail, facsimile or electronic mail not later than 4:00 p.m. CT the day after the match. A cashier’s check or money order for $500 made payable to “USSF” must be received by the second business day after the match. The Commissioner shall immediately refer the protest to the Adjudication and Discipline Panel for decision. At this point, nobody is sure what decision will be reached, but it does appear there was some confusion about player status, but this has happened in the history of the U.S. Open Cup. Action at this point could involve disqualifying LAFC from the proceedings, fining the side, or some other discipline. Regardless, it's a very big action to take here. One of the big questions of this transfer window is does Fanendo Adi stay? I can understand Portland's side after initially wondering about why they were protesting yet seemed to state they accepted the results. Filing a protest is really the only way to have the issue fully resolved for the USOC and USSF, and so this is important. Portland is not asking for the result to be abandoned either, so the consensus among soccer experts is that LAFC will either be fined yet allowed to advance or the match will be completely replayed with valid rosters. Neither situation is totally ideal for the clubs, but considering the severity of the situation, I am thinking the replay is the most fair. Portland does have an extended home stand for the next few weeks without weekday matches, but the question would be when LAFC could fit it in without throwing chaos into the next round considering USOC semifinals were slated for August 7. So for now, Philadelphia plays Chicago on August 8 while Houston awaits this mess to know who they will end up playing. For those interested, you can track more on this at the very excellent website, thecup.us, who even let this guy write for them earlier this year. Did a Timbers player use a racial slur? After the match, Diomande put on his Instagram account that he was referred to using a slur while on the pitch during the USOC match. 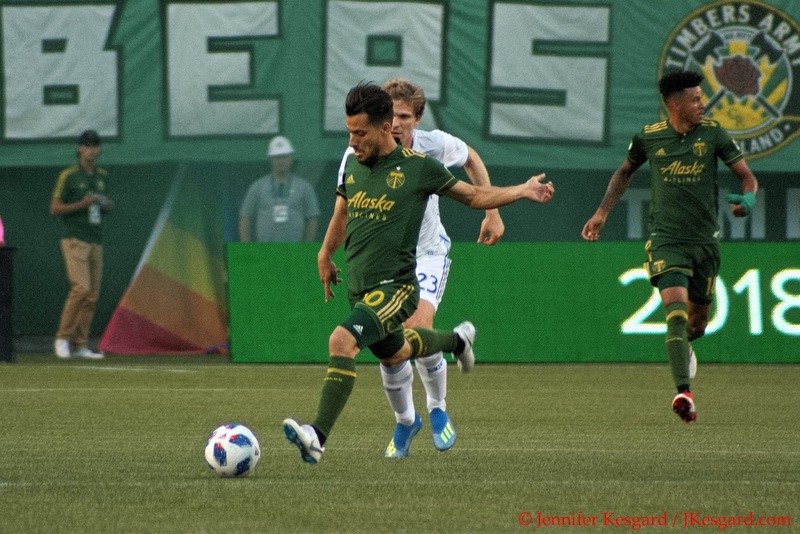 The account didn't indicate if it was a player or fan that used the term, but on the story posted by ESPN, Diomande scrapped with several Timbers players over the second half of the match, including exchanging words with several players after a hard foul on Vela in the 90th minute followed by harsh words when Cascante fouled him in stoppage time. Portland issued a statement that they are investigating the issue and condone the use of the word, and MLS will actually be looking into the issue further. I know several of the players in my dealings here and can speak to their tremendous character, so I'm shocked by the events myself. I do also know that when emotions boil over, there can be tendencies to not be as filtered in word choice, but that doesn't excuse the use of this word in any context. I believe Diomande's statement, and my hope is that the situation can be resolved in a mindful manner. I don't want to believe that something like this could happen and a player wearing a Timbers crest could do this, but in the current world order, we are constantly barraged with unspeakable comments on a daily basis. It doesn't excuse the actions, though, and I just want the party or parties held accountable. Is the Sunshine Flag offensive? Ever since being created in 2004, one of the traditions of the Timbers Army is to unfurl the Sunshine Flag after a goal in celebration. The brainchild of the early Timbers Army based off a sunburst design that came from headbands, the flag debuted in July 2004 and has been a staple of the TA for many years. During the LAFC match, several comments appeared in social media about the flag's design being similar to other logos used by extremist groups, and as such, it might be offensive to other cultures. On July 18, there were several long discussion threads about the design, the inspiration, and its message on social media discussing several key points. As someone who joined the Timbers Army about the time the flag was created, I don't recall any questions about the design or concerns - the group liked the sunburst design and wanted a big flag, so the inspiration came from there. Through the work of several Timbers Army members, the Big A$$ Flag was created and has flown in various version for several seasons. I'm attached to it obviously because passing it over the section was one of my very first Timbers Army memories. I could even withstand the stench of musk, stale beer and mold as it passed over. The flag was held with care and repaired several times, washed whenever the smell was too terrible, and held out to dry whenever the rains got to be too much. It's a wonderful symbol of celebration - but one that honestly I hadn't considered offensive before. I have read through many of the thoughtful comments posted, and if the design is too similar to other logos that are deemed offensive, I think it's a valid discussion to see if there is a better representation that could be used. I'm all for tradition as it brings comfort in the consistency, but as I'm learning over the years, comfort is no excuse for intolerance. We all need to be sensitive to our words and actions, and while I still have plenty of moments of slip ups, I'm trying to learn to be more aware of my comments and the intent behind them. If changing the flag can be a further catalyst for this growth, then I am in full support of this endeavor.